Recorded at the Iruma-shi Shimin Kaikan Concert Hall on December 17 & 18, 2002. Released in Japan on October 21, 2003. Producer: Hiroki Mori; Director: Tsutomu Ono; Engineer: Ken Fukata; Photo of Yukiko Sugihara: Shigeru Jufuku; Translation: Takayoshi Yamaji, Kenichi Sakamaki; Designer: Tadashi Kurosawa. The other composers whose works are performed on this disc are Leevi Madetoja (2), Jean Sibelius, Gustav Ernesaks, Emilis Melngailis, Jãnis Cirulis, Jonas Tamulionis and Juozas Tallat-Kelpša. Muistse mere laulud was commissioned for the 1980 Moscow Olympic Games sailing regatta which took place in Tallinn, Estonia. Incantatio maris aestuosi was a co-commission by the Orphei Drängar (The Serfs of Orpheus) Male Choir of Sweden and the YL Ylioppilaskunnan Laulujat (Helsinki University Male Voice Choir) of Finland. One of the conditions of the commission was that the text of the work could not be in either of the main two languages of the choirs themselves. Incantatio maris aestuosi is in memoriam to the MV Estonia ferry which sank on September 29, 1994 while in the Baltic Sea travelling between Sweden and Estonia. In this largest ever peacetime maritime disaster on the Baltic Sea, of the approximately 989 passengers and crew, only 137 were rescued. Muistse mere laulud is published by Fennica Gehrman Oy Ab (previously Fazer Music Estonia). Incantatio maris aestuosi is published by YL Ylioppilaskunnan Laulajat (Helsinki University Male Voice Choir) . This recording and associated concerts by the Waseda University Glee Club are dedicated to the memory of Japanese diplomat Chiune Sugihara (1900-1986) who was the vice-consul in the Japanese consulate in Kaunas, Lithuania at the start of World War II. Against their own government's orders, by issuing travel visas (the CD cover at top left is a reproduction of one of these visas), he and his wife Yukiko Sugihara were able to save the lives of thousands of Jewish refugees who were fleeing through Lithuania to escape Nazi extermination. You can read further about Chiune Sugihara at the Sugihara Office Japan website, at the Simon Wiesenthal Centre website, and at the Jewish Virtual Library among other places. Waseda University was also the alma mater of Chiune Sugihara. 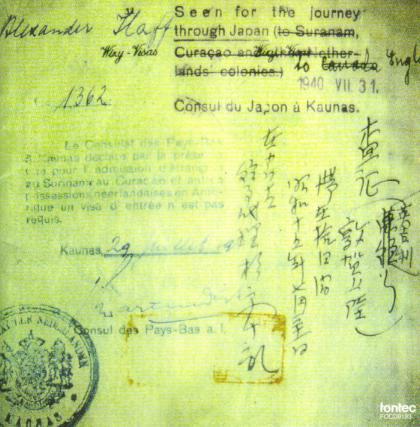 The CD booklet contains an introduction by Yukiko Sugihara (in Japanese and English), a history Chiune Sugihara - A Diplomat of Humanity by Katsumasa Watanabe (in Japanese and English), representative of the Chiune Sugihara Study Group (in Japanese and English), notes on the composition Natus in curas op. 283, which was especially commissioned by the Waseda University Glee Club, by the composer, Jonas Tamulionis and also by the conductor, Chifuru Matsubara (both in Japanese and English), and brief notes in Japanese only on the other works. There is also a brief biography of Jonas Tamulionis, a brief history of the Waseda University Glee Club and a brief biography of the conductor Chifuru Matsubara (all of these in Japanese and English). There are also complete original sung texts (Latin, Finnish, Estonian, Latvian, Lithuanian) provided for the works with their translations into Japanese. The website of the record company is at http://www.fontec.co.jp where online orders can be made (in Japanese or English). The website of the Waseda University Glee Club can be seen at http://www.wasedaglee.com. Chifuru Matsubara, conductor on this CD, is also the principal conductor of the Tokyo Philharmonic Chorus. This disc can also be ordered from other online stores such as Amazon Japan (also in Japanese or English).